I’ve struggled with the political climate lately—the inattention to critical issues, the active attempts to destroy civil rights, the systemic misalignment of wealth towards those in power, the appalling lack of empathy. Like many people, I find my focus lacking, my productivity down, and my nervous system overwhelmed. As someone who thrives on information, it’s hard not to be sucked into reading the news, but reading the news only shreds my nerves further. I find it difficult to sleep restfully through the night. Last night I attended a Phi Beta Kappa dinner and lecture. 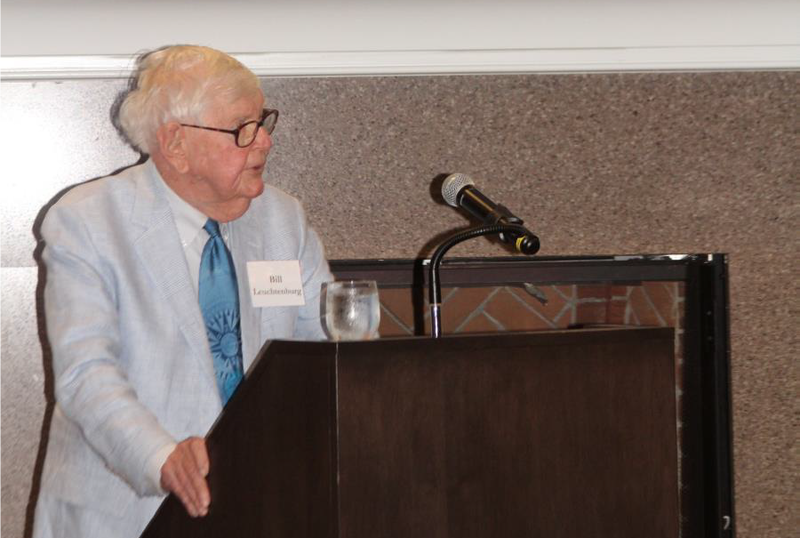 Renowned historian and UNC-Chapel Hill professor emeritus Dr. William Leuchtenburg was the honoree and speaker for the evening. Dr. Leuchtenburg is a noted presidential scholar and expert on FDR. 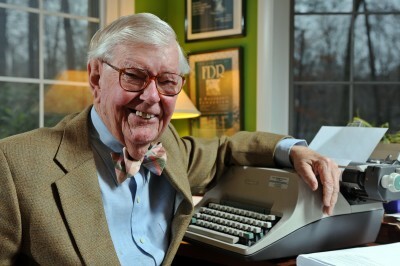 He’s done election-night political analysis for some of the major newscasters of our time; he’s consulted with Ken Burns on his documentaries; he marched with Dr. Martin Luther King Jr. in Alabama. Dr. Leuchtenburg gave the address, “The White House and the South.” It was fascinating and depressing all at once, in particular to hear the role race and the one-party system had played. The professor noted that at our country’s founding, Southerners held the White House for something like 32 of the first 36 years, lost control for over 100 years, and now are again winning presidential races more than half the time. It’s not as much hope as the refusal to despair. As he said that, I felt myself regain perspective—not minimizing our current frustrations, but recognizing what he said as true. His words soothed me. When I got home, I didn’t want to let them go. I didn’t check the news, I didn’t look at email, I didn’t even open my beloved Jane Austen for fear of interrupting the calm that had wrapped me. And I slept all night. Did the French devise tetherball too? As a fairly experienced poet, I found the course a good refresher, and I even took away a few new terms (synecdoche, metonymy). The sample poems studied were fresher than one often finds in an introductory level poetry class, which offered a chance to meet some new voices. I’d also note the instructor has an amusing (to me) sense of humor and the production quality of the videos is high relative to other online courses I’ve taken. Week 2 of the class focused on image (things you can literally touch/taste/see/hear/smell) and abstraction (things for which we have symbols, e.g., a heart for love). One of the fun assignments was to make up a title in the format “The [Concrete noun] of [Abstract noun],” then write that poem. Christmas week we lost another chicken, the second in 2015 (we lost Victoria in February). Poor little Anne had been showing some oddities throughout the year but in December she started showing more specific symptoms (lack of appetite, lethargy, etc. ), and just before solstice we took her to the vet at NC State. We weren’t willing to do extensive tests and treatment, and the vet said even with them, Anne probably had something serious (e.g., cancer rather something simple like worms). We decided to euthanize her and have an autopsy done. Preliminary results suggested Marek’s, which is a viral disease chickens are susceptible to. While our chickens were vaccinated for Marek’s, chances are the vaccination wears off at some point (it probably varies by breed). In Anne’s case, the disease resulted in tumors all over her insides that compressed her egg-laying apparatus as well as her GI tract. We were relieved that the autopsy results showed she had something wrong that we couldn’t have prevented. (We want to be good chickenparents!) And we felt comfortable that we made the right decision about euthanization. As a side benefit, the NC State vet program lets the veterinary students do the autopsies as part of their studies; it made us happy to contribute in that way too. The photos on this page are not recent. 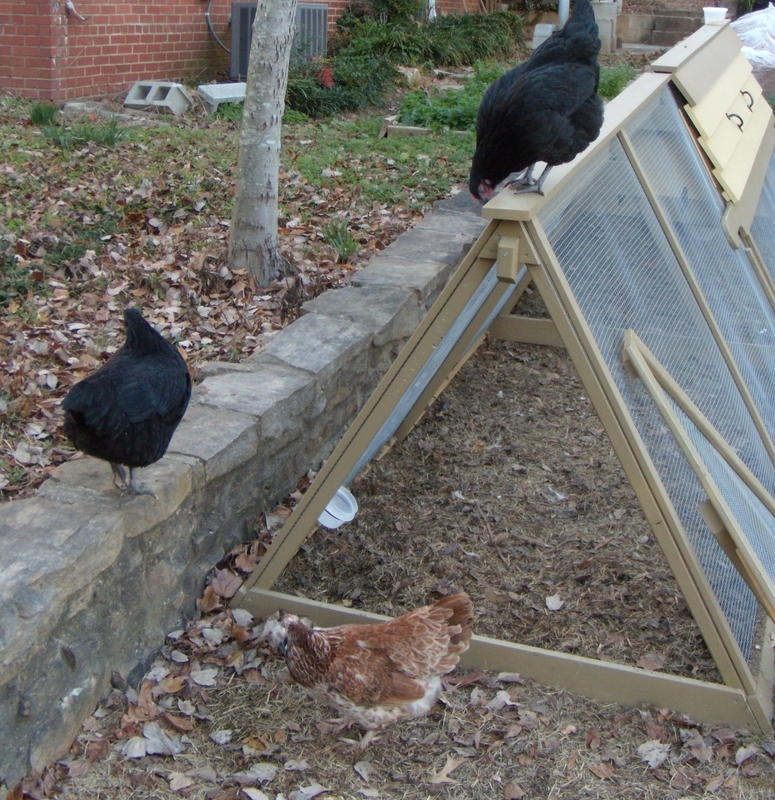 As the chickens have aged, they’ve been less interested in jumping up to the heights. (Leave that for the little chirps!) 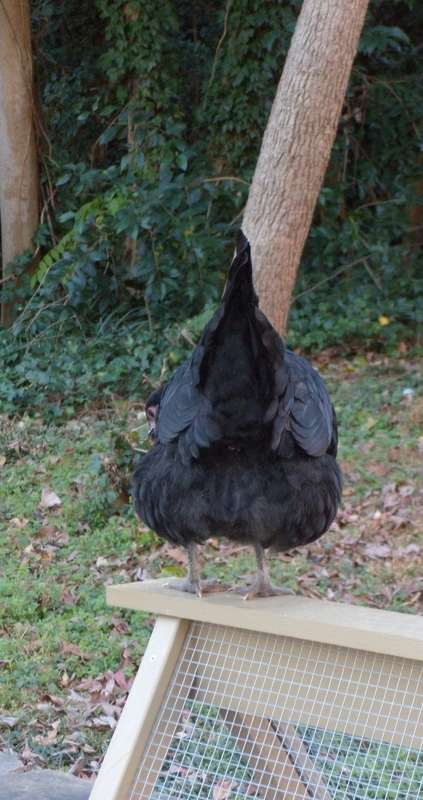 But shortly before Anne got sick she started flapping up to the top of the coop again. Margaret would follow sometimes, but she is bigger and ungainlier than Anne was, so struggled to get her heft up there. When the chickens jump up to the coop (or chair or bench), we always imagine they are saying, “I like to be tall, Chickenmama! I like to see everything, Chickenpapa!” I guess she wanted one last look before the dark night came. We miss you, little Annabel! Bye-bye! Today (Nov 15, 2015) Owning Ourselves: A Practical Guide to Awakening the Western Mind is available FREE on Kindle. 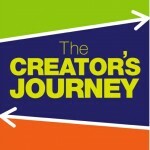 I had the pleasure of working with the author on editing and publishing this book. He’s a great guy, and you can read more about him and his approach to life on his Owning Ourselves blog. Take a look! Do you sense there’s something more to life? Do you feel you’re missing something? 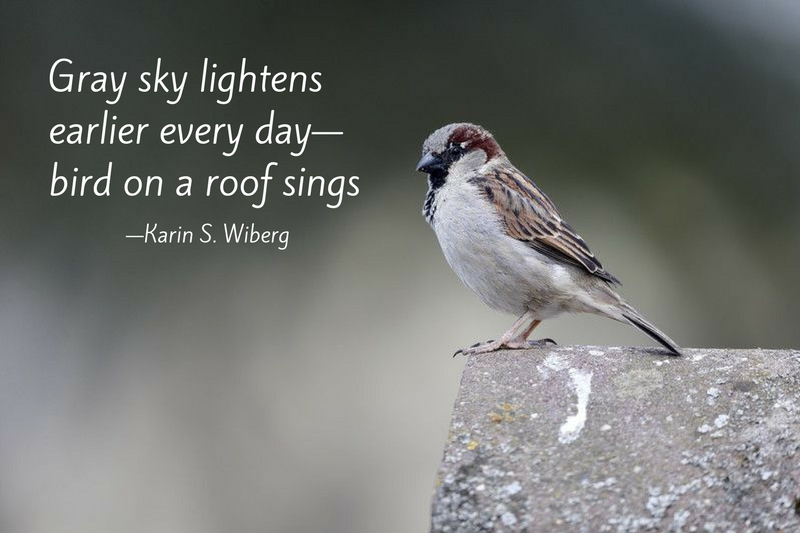 Do you feel trapped by circumstances? Can’t find a way out? Do you feel disconnected from your true self? Does life seem like a hollow farce or a shame-filled tragedy? Have you relied on thinking as the only proper response to the confusion of life, only to discover that thinking is its own trap? 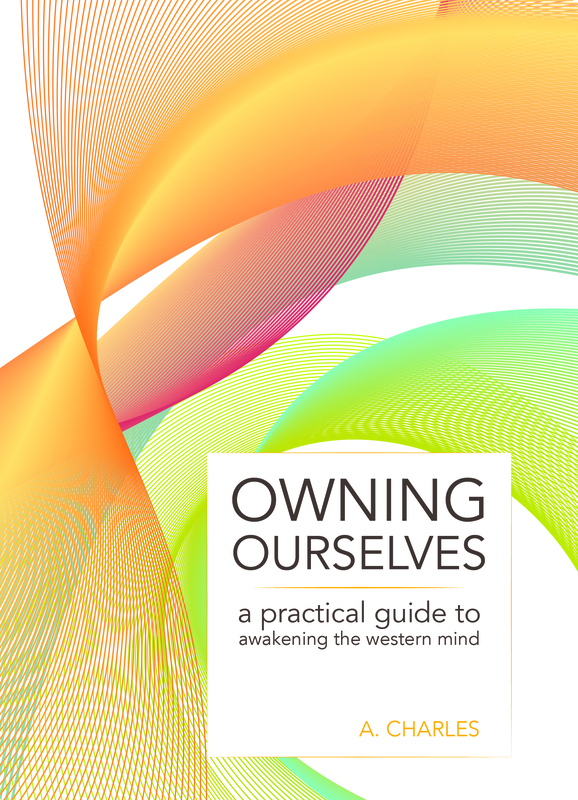 In Owning Ourselves: A Practical Guide to Awakening the Western Mind, A. Charles describes the path many of us have taken, only to find ourselves cornered and asleep. He then offers an approach to awaken our minds to the possibilities of the world and to the possibilities inherent in all of us. This book is for all of us who want to move forward with relief, awareness, authenticity and joy. One of my big projects over the past year was working with Becky Sansbury to develop her book After The Shock: Getting You Back On The Road To Resilience When Crisis Hits You Head On. I know the content of the book intimately and can tell you without a doubt that Becky offers practical, comforting advice for those in crisis or walking alongside someone in crisis. 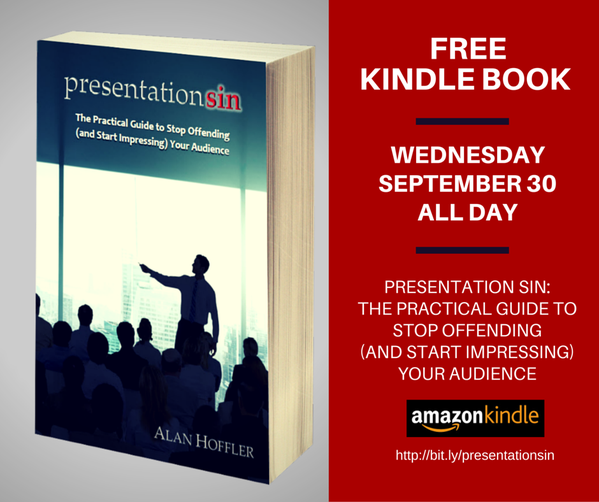 TODAY and THURSDAY (10/7 and 10/8) you can download the Kindle version FREE. Do it! When you hear the word crisis what do you think? A dramatic car wreck. A critical medical diagnosis. Divorce. Job loss. Natural disaster. Death. What about the mini-shocks within those crises or the smaller events that disrupt our lives more frequently? A fender bender in rush-hour traffic. Personal information getting hacked. Being overlooked for a promotion. When crisis hits, large or small, we are thrown off balance.In After The Shock: Getting You Back On The Road To Resilience When Crisis Hits You Head On, Becky Sansbury introduces a sustainable model to help you stabilize and move toward resilience. After decades of working with people in crisis, she determined that four factors give us balance, strength and support throughout our lives, but especially in shocking times. Like the four tires of a car, comfort, control, community, and connection to something bigger than self provide both a base and a cushion for navigating the ruts and potholes of life. But that is not enough to move us on to resilience. In the overwhelming confusion of crisis we crave a space safe for focusing on our current experience, strengthened by crucial lessons from the past. We make both casual and far-reaching decisions based on assumptions that may no longer be authentic or lead to our desired future. We grasp for resources, often unsure of what we need. Expanding the car metaphor, in After the Shock the reader learns effective ways to use the frame of experience, the steering capacity of assumptions, and the fuel of resources to lead toward more resilient responses in a variety of crises. Reach for After the Shock to nurture healing through warmth and wisdom. Written in a conversational style, this book provides practical tools while wrapping you with virtual arms of support as you make your way from reaction to resilience.